Kathy Zahedi, DDS & Associates, located in Santa Monica, California specializes in providing state-of-the-art dental implants to restore oral function and aesethetics. If you have missing or damaged teeth, call our office for a professional consultation. Dental implants are the most natural looking and best functioning permanent prosthetics available for replacing missing teeth. A dental implant consists of a titanium post that's surgically implanted directly into your jaw bone and serves as the tooth's root. It is topped with a porcelain crown that is custom made to match your natural, neighboring teeth. Thanks to today's advanced technology and materials, dental implants are hard discerned from your natural teeth and can last a lifetime. 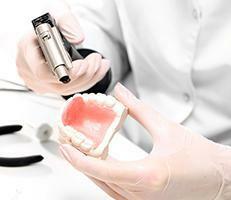 What does the process of getting dental implants entail? The titanium post is surgically implanted into your jawbone. Over time, it fuses naturally to the bone. This process is called osseointegration. Initially, the post is topped with a temporary crown. Once osseointegration is complete, a permanent one, custom shaped from porcelain and color tinted, is installed in its place. Are implants used for more that aesthetic reasons? Yes. Replacing gaps left by missing teeth is important to maintaining both the function of your teeth and your overall oral health. When missing teeth are not replaced, the gaps left can set off a series of oral health problems. The jaw bone begins to deteriorate. Also, neighboring teeth move to fill in the gap. This can cause your bite to shift out of alignment, which in turn can cause teeth to wear down and create other spaces where plague can accumulate. The accumulation of plague further promotes tooth decay and gum disease. What are the advantages of dental implants over other options to replace missing teeth? They are not only the most natural looking and durable option. They are also the only restorative method that preserves and stimulates natural bone growth. Dental implants require only the same care as your natural teeth: regular brushing, flossing and twice yearly dental examinations and cleanings. Please click here for more information on implant-based dental care restorations.